A mysterious object seen in the California sky late Wednesday sent a flurry of people searching for answers. NASA confirmed Thursday that it was a meteor after the bright light in the sky got everyone speculating what it could have been. The space agency said the meteor went down in the ocean. 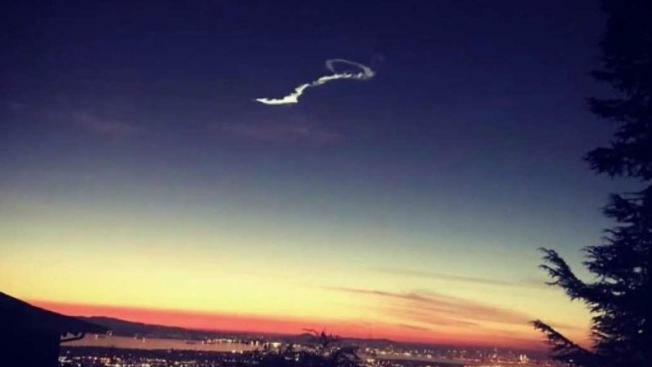 Lick Observatory in San Jose said the flash across the sky was likely some type of meteor, and NBC Bay Area Chief Meteorologist Jeff Ranieri affirmed that report, saying it likely was a "meteor fireball or bolide," with slimmer chance of it being "space junk." Dr. David Reitzel with the Griffith Observatory in Los Angeles also said he believes it was a bolide, which left the trail in the sky that was illuminated by the remaining sunlight. The meteor was at a high altitude which was why there were reports of it being seen up and down the coast and even in Nevada. Before it was confirmed that the light was a meteor, NBC Bay Area reached out to the United States Air Force at NORAD Headquarters and officials said there was "no threat to Canada and the United States at this time." Even after NASA confirmed that the phenomenon was a meteor, people were still skeptical because the light made a swirl instead of a straight line as gravity pulled the meteor down. Why did the aftermath of the meteor look like that? NASA explained in a 2012 article that meteors smoke can make a strange-looking noctilucent cloud, or NLC, in the sky. "They look alien. The electric-blue ripples and pale tendrils of NLCs reaching across the night sky resemble something from another world," the government space agency wrote. The meteor smoke helps water molecules form, creating ice crystals around meteoritic dust, NASA said. The small ice crystal particles scatter wavelengths of light and when the sunlight hits the NLC, the weird cloud then can be witnessed on Earth.